(Toronto, Ont.) 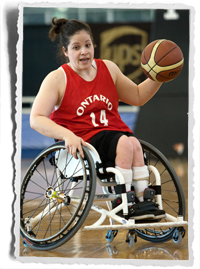 The Ontario Wheelchair Sports Association (OWSA) is proud to announce the 12 athletes selected to represent Team Ontario at the 2015 Canada Winter Games in wheelchair basketball. The team will be coached by Michael Broughton and Kathy Ludwig. Linda Beacham is the team manager. Team Ontario placed second at the last Canada Winter Games in 2011 in Halifax, N.S. The Ontario Wheelchair Sports Association (OWSA) is dedicated to the development and promotion of athlete centered, amateur wheelchair sport programs. For more information, please visit www.ontwheelchairsports.org.